ITAHARI, Oct 24: It was around 7:45 pm on Monday when a group of villagers in Sonapur of Sunsari informed a police team on patrol about an injured boy nearby. Police immediately reached the site and found the boy in agony on the roadside. His right hand and neck were burnt with acid. Police started asking questions to the boy. He replied that he was from Hospital Chowk of Biratnagar. He told that his father's name is Ashok Pariyar and his name is Dipen. Police then admitted the 14-year-old Dipen to BP Koirala Institute of Health and Sciences (BPKIHS). Police speculate that an unidentified group must have attacked the child with acid in some other place and later left him in Sonapur. "The boy told us that two people left him in Sonapur on Monday evening," said Inspector Ram Narayan Majhi of Area Police Office, Duhabi, adding, "We are yet to find the reason behind the incident." The parents of the child are still out of contact. "We are searching for his family members and relatives but in vain," said Majhi, adding, "In the absence of family members, the child has been undergoing treatment under the security of police." The security personnel of BPKIHS have been deployed to look after the child. "Dipen is undergoing treatment in the Pediatrics Intensive Care Unit (PICU)," said Tilak Giri, superintendent of BPKIHS. As informed by the child, he does not have his mother and his father is a mechanic. According to Giri, it would be easier to find out more about the child once his family members or relatives come into contact. 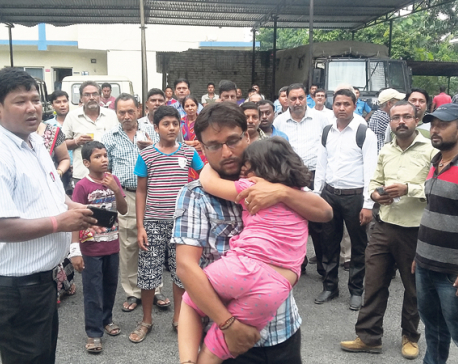 Dr Pashupati Shumsher Chaudhary, spokesperson of BPKIHS, informed Republica that it has been found that the child was beaten and poured acid by his seniors. The condition of the child is improving, say doctors involved in his treatment. "Dipen says that his seniors sometime used to make him smell something which he suspects is a drug," said Chaudhary.